Arrive at Delhi International Airport. And transfer to the hotel. Overnight at hotel. Morning transfer to airport for flight to Bagdogra. Welcome on arrival and departure to Darjeeling via traditional tea road that climbs the high pre-Himalayan hills. Darjeeling is an enchanting resort created in the 19th century by the British who were looking for softness and cool climate where the heat and the monsoon raged in Calcutta. These are developed the most famous tea gardens of the world. The city has kept its British side with its beautiful colonial houses. 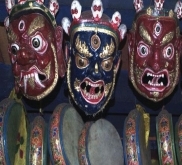 By late afternoon, stroll through the bustling picturesque Chowk Bazar to take the pulse of the city and get to know the main ethnic groups of the region: Lepcha, the oldest inhabitants of the region, Bhotias from Tibet, Nepali, Bengali and Tibetan refugees. Overnight at hotel. Lever matinal pour aller admirer le lever du soleil depuis la colline du Tigre sur la chaîne himalayenne dominée par le troisième sommet le plus haut du monde, le mont Kanchenjunga qui culmine à 8 597 mètres. Ensuite, excursion à Ghoom, où résida Alexandra David-Neel, et découverte du monastère affilié aux « Bonnets Jaunes » et de sa célèbre statue de Maitreya, le Bouddha des temps futurs. Le monastère renferme des manuscrits bouddhistes d’une grande rareté. Puis, sur la colline de l’Observatoire, visite de l’Institut de Haute Montagne qui illustre les premières expéditions himalayennes. Retour à Darjeeling et visite de la ville qui fut la résidence d’été des vice-rois des Indes lorsque Calcutta en était la capitale. Nuit à l’hôtel. Leave for Pemayangtse on the side deep valleys. During transit, walk in the famous tea plantations that cover the sides of the mountains. On arrival at Pemayangtse, site visit and Tantric Monastery Ningma, the sublime Lotus of the sect of "Red Hats". The monastery is dedicated to the great initiator of Buddhism in Sikkim. Pemayangtse is the second oldest monastery in the state and was built for the monks of pure Tibetan lineage, single, no physical abnormality and this practice is still in force today. The monastery walls are embellished with frescoes and murals of rare refinement and an extraordinary symbolic profusion. Overnight at hotel. The capital of Sikkim is home to the Institute of Tibetology, which contains beautiful thangka painted canvases of beauty. Visit the monastery of Enchey, then direction Phodong to visit his monastery which stands in beautiful scenery. His special decorations describe the Buddhist hell. Overnight at hotel. Morning drive through the hills where grow lush rhododendron bushes to reach the market town of Kalimpong, a major center of flower crops. The city has a number of old houses tell their past life and show the legacy of decades. Arrive Kalimpong and visit Thongsa Gompa, the oldest monastery in the region. Then, the Monastery of Durpin Dara, Zong Dong Pho-Brang Palari built on the highest point of the city where the view is superb. Then walk in the picturesque market Kalimpong which also assumes the role of floral nursery where no fewer than a dozen institutions produce and export these exotic flowers found in all markets of the world: amaryllis, lilies, anthuriums orchids. Visit a farm of orchids. Overnight at hotel. Direction Bhutan, the Land of the Dragon, and his border post Phuntsoling. The road passes through beautiful forests and vast tea plantations of the Indian plain. An imposing gate in true Bhutanese architectural style, guards bearing the national costume show that we have arrived at your destination. 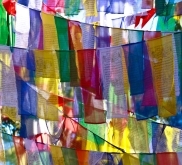 The small town of Phuntsoling is the lung of the Bhutanese economy to India. Overnight at hotel. On the way to Thimphu, the capital, visit the monastery of Kharbandi, from where one has a beautiful view of the valley and the town of Phuntsoling. This magnificent monastery, located in a garden of tropical plants, contains paintings depicting the life of Buddha and some statues. It was built by the grandmother of the present king. Continuation of the splendid road that clings to the sides of the Torsa Valley, turn after turn, to Chhuka, then Simtokha Thimphu. A Simtokha visit the oldest monastery in the kingdom which now houses the School of Religious and Cultural Studies. Before arriving in Thimphu, stop at Kuensel Phodrang, the "Buddha Point" overlooking the entire valley where the country's largest statue of Buddha is located. A Thimphu, visit the mini Takin zoo, which houses the National eponymous animal, exclusively present in Bhutan. Then walk in Norzim Lam, the main street lined with craft shops. Overnight at hotel. In the morning, visit the National Textile Museum where is preserved a collection of antique fabrics, rich colors and original and varied reasons. Then visit the Folk Heritage Museum which recreates traditional rural life and habitat. Then the Traditional Arts school where young people learn the ancient craft techniques to protect and bequeath the country's cultural heritage for future generations. The National Library, rich in a large collection of ancient Buddhist texts and manuscripts is also worth visiting. Visit the Memorial Chorten with beautiful paintings and sculptures, then Tashichhoe Dzong, quadrilateral impressive fortress that houses the splendid administrative buildings of the kingdom. Overnight at hotel. Road to the smiling Punakha valley through the neck of Dochula to almost 3100 meters. From there on a clear day, the view of the Himalayan ranges is breathtaking. Stop at 108 chortens, stupas, built on the hill to the King of Bhutan and Druk Wangyal Lhakhang visit a temple built in homage to peace and stability provided by the fourth king. Then visit the Monastery of the Divine Madman, Chhimi Lhakhang, famous for its sanctuary of the 15th century. This professor owes its reputation to the various types of education. Continue to Punakha, the former capital of Bhutan from 1637 to 1907, when the civil architecture is remarkable finesse, sobriety and elegance. Overnight at hotel. Continue to Paro, the second largest city of Bhutan. Stop to visit the Dzong Wangdue Phodrang, crowning a rocky spur at the confluence of two rivers: the Pochu the river Mochu Man and the Woman River. 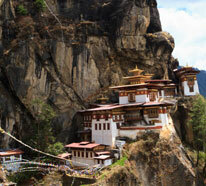 Built in 1637, this fortress was used as administrative and religious headquarters in the region and has long been the winter residence of the kings of Bhutan. Arrival at Paro and visit the National Museum, housed in the former Ta Dzong, ie the Watchtower, which in itself has an excellent summary of the Tibetan culture. Then along a hillside trail ride to Rimpong Dzong, one of the finest examples of Bhutanese architecture. It has remarkable paintings illustrating the legendary cycles of Buddhism. Overnight at hotel. Ascension by a steep path up to the assault of the cliff where clings, defying the vacuum, the Monastery of Taksang dubbed the Lair of the Tiger. Perched at an altitude of 2800, it is one of the most revered shrines in the Himalayan world. It is possible to play a game of Wasps (payable locally) but the descent is not done on foot. Back in the Paro valley and on the way visit the monastery Kyichu Lhakhang, one of the oldest monasteries in the country reflecting the introduction of Buddhism. Overnight at hotel. Morning transfer to airport for flight to Delhi. And transfer to the hotel. Rest of the day free. Overnight at hotel. Transfer to Delhi international airport for the return flight. You will find below our selection of hotels for this trip. Hotels indicative, subject to availability. The choice of accommodation category belongs to you. You will be able to specify it in your quote. Team and cozy enough for this modern hotel. Rooms very clean and well appointed. Wifi access. Complete small lunch. Hotel with the charm of yesteryear. Enjoy sublime views of the mountains and the valley. Place surrounded by flowers. Friendly and helpful staff. Spacious and comfortable rooms. A beautiful place. Beautiful spa, sauna and steam room. A beautiful library. Friendly staff. Great location with on one side the Kanchenjunga and other Pelling city. At 10 kilometers from the city, beautiful complex with large rooms with balconies. Excellent spa. A wonderful place to relax. Lovely hotel with a very nice garden, spacious and beautifully decorated rooms. Friendly and helpful staff. Good location near the city center. Transit hotel after crossing the border between India and Bhutan. Establishing correct, simple, clean and neat. Next to the Visa Office. Very central location with shops and restaurants within walking distance. Clean and comfortable rooms with modern decor and gargantuan breakfast. Staff very friendly, courteous and always willing to help. Spacious rooms with an exceptional view of the Punakha valley and the river. Warm, attentive staff. The hotel has a spa. Bhutanese traditional hotel located in a beautiful spot overlooking the Paro valley. Large rooms with traditional décor. Very nice welcome. You will find below our suggestion of activities to do throughout your journey. Do not hesitate to contact a counselor Aryavrit Travels for any specific request. Wander through India or Nepal aboard the legendary Royal Enfield. This breakaway motorcycle delight lovers of nature and you will discover the diversity of landscapes. Trekking lovers will be amazed by browsing through the valleys of the Himalayas, with fantastic views of the highest mountain in the world and a dive in the Buddhist culture, monasteries preserved villages and several levels of difficulty.